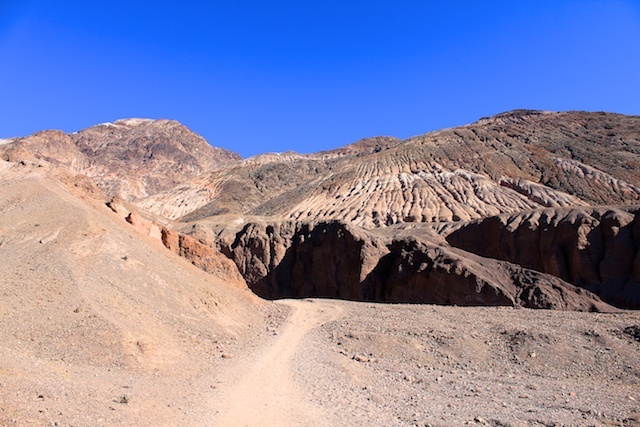 Death Valley is full of unique and interesting places to visit. From Devils Golf Course to the Racetrack it has a large collection of odd natural formations, and the rock bridge is one of them. 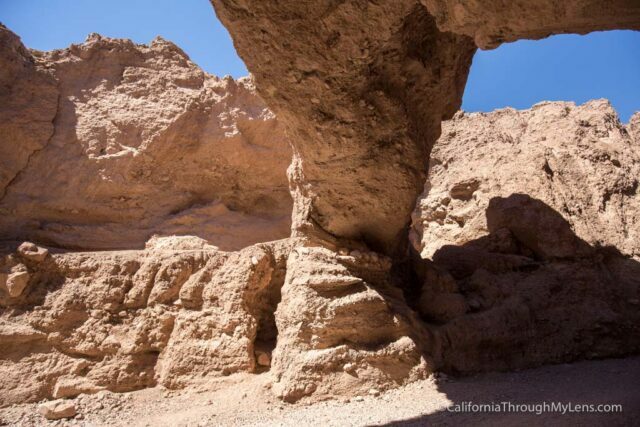 The natural rock bridge in Death Valley is located only a short 10 minute drive from Badwater along a dirt road. 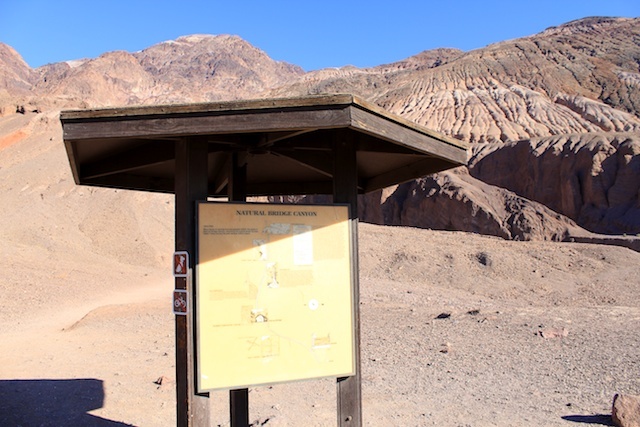 The start of the walk to this bridge is one of the only areas in Death Valley with an actual trail head and it is accessible by driving about a mile down a dirt road. We were able to do this drive in our Toyota Matrix so most cars should be fine with it. 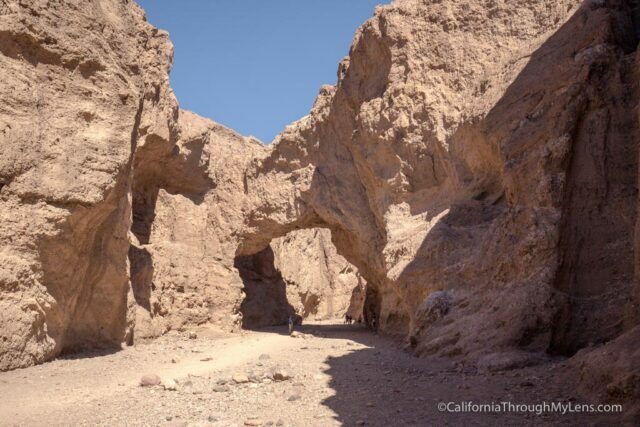 The bridge is located about 15 minutes from the trail head but it is a steady uphill climb the entire way, so make sure you take your time and bring lots of water if you are hiking it in the hot summer months. After about ten minutes of walking you will turn a corner and see the bridge in the distance. It does not look like much from the initial sighting, but as you get closer to it you really are able to see the sheer size of this rock bridge. The bridge itself is worth checking out. It is a lot bigger then it looks in the pictures and really is a unique thing to see since it spans such a large gap and is still so big. For the adventures it looks like there were many different ways to climb up closer to the bridge and maybe even get on top, but we didn’t press our luck. The bridge itself has a lot of large cracks in it, as you can see below,so you wonder how long it will still be standing as majestic as it is today. 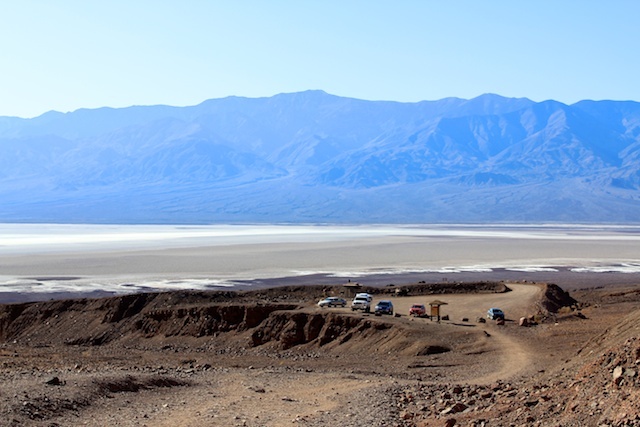 Also of note, on the way back down to the parking area you can get a great view of the salt flats near Badwater. 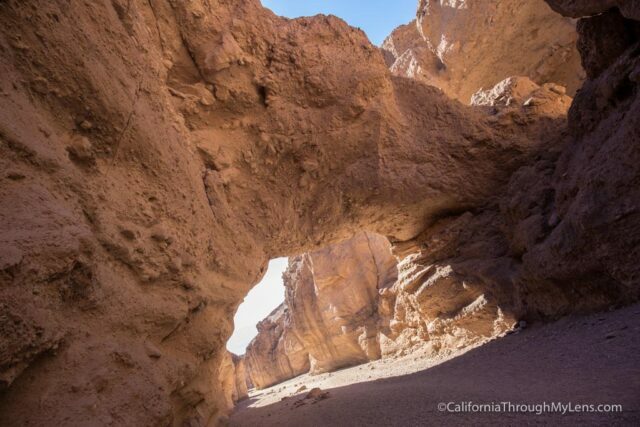 This is a great stop in Death Valley as it is easy to get to and very rewarding for the photographer, I would recommend checking it out. You can see more pictures and directions below.